My new obsession with pumpkin spice started after a co-worker and I made a trip to starbucks and I was immediately hooked on pumpkin spice latte. (Usually I order black tea/lemondate) In a perfect world I would make a trip to Starbucks every morning but their isn't one on my route to school! (Probably good for the budget!) 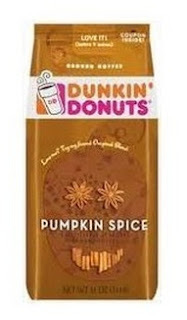 On a late night run to wal-mart for craft supplies, I found Pumpkin Spice coffee from Dunkin Donuts and Pumpkin Spice Creamer which has been a FABULOUS way to start my mornings this fall! Tomorrow my teacher cadett will complete a follow up election activity with my class on writing a letter to the President! She has already prepared an example letter on a poster board to use as an example and the students will get a chance to write their own letters! This group has totally blown me away with their enthusiasm, opinions, and creativity with the election activities! I can't wait to see the look on their face when we tell them the letters will be mailed to the White House on Friday!!!!! I cannot take credit for this activity but this has been a great addition to our week of election activities! This was another amazing activity from Teacher to the Core! Check out her blog to see all of her other fabulous ideas!